Originally I wanted to do all of the TSM braziers, but some of them didn’t like to get extracted for some reason – or rather, they didn’t like to get decompiled (not that I blame them, it sounds quite painful), which means I couldn’t get the mesh out. 😦 So, five is what you get. I haven’t touched the poly count on any of them, so some might be a bit on the high-ish side. Also, the effects used are harder to render than animations, so if you’re on a slow computer that doesn’t do graphics very well, you might want to give some of these a pass. All the pictures of the recolours are taken outdoors to allow you to see them properly. The size comparison pictures are taken indoors; they show you the actual light from the lamp. So. First, we have the Resolute Fieldstone Crisis Beacon, which costs $105 and is poly (>1000). The base and the pot have separate recolours, so you can mix and match ’em ’til your heart’s content. Next is the Ars Magique Arachnoid Brazier – $110, poly. Then we have the Triped Courtroom Coalpot – $125, poly (>2000). Now, the TSM original is almost as tall as a Sim, which might work in courtyards but not quite so well indoors, so I’ve made a scaled-down, indoors-appropriate version of it as well. You can mix and match the pot and the leg recols for these, too, but note that if you delete a recolour, you delete it for both the legs and the pot. Also, I’ve used the repository technique for these, so the large tripod is slaved to the small one. Next up is the Great Dúnhelirath Brazier – $300, poly. Again, the TSM original is quite large – you could fry a Sim in it and still have room to spare – so you get a scaled down version of this one as well. Also, the large brazier is a little larger than one tile, so if you place it right next to a wall, there will be clipping. (Yes, it probably would have been happier on four tiles, but multi-tile floor lamps… yeah, that won’t be happening.) You can move it with the M&G quartertile cheat, though. These, too, are repositoried, so the large brazier is slaved to the small one. 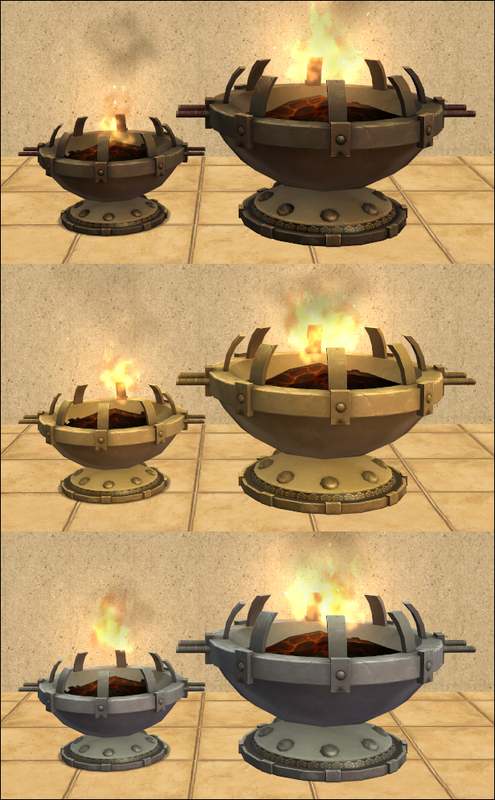 Also, the large brazier uses no less than three different effects to get a decent-sized fire, so if your computer have problems rendering effects, you might want to give it a pass (hence why this is the slave and not the master). But wait! We’re not done yet! I promised you a crystal ball, didn’t I? 😉 The VermenKrakki Crystal Glimmer Orb costs $75 and is poly. It doesn’t use effects, but the crystal ball is animated and changes colour ever so slightly when the lamp is turned on. You get both a floor version (which is the TSM original) and a table one, and the table lamp is slaved to the floor lamp. You can mix and match the colours of the twirly part and the straight part of the base, but just as with the tripod, if you delete a recolour, you delete it for both parts. This entry was posted on 11 October, 2013 at 13:20	and is filed under BUY MODE, CONVERSIONS, DOWNLOADS, Lighting, Medieval-ish, Objects, THEMES, TSM. You can follow any responses to this entry through the RSS 2.0 feed. You can leave a response, or trackback from your own site. Exactly! Hope you are prospering my fellow Trekker! I just got out of hospital (day surgery) but I am doing so much better now. My grandchildren are coming for 2 weeks at Christmas and I am looking forward to being able to do things with them. Love your updates here. Wow, I had such a different vision of you being very young and healthy and so very smart. I mean not that you are not young and smart… 🙂 Our preconceived notions about people we have only met in print could be really amusing. I hope your flare ups stay in the past tense or at least be very mild. Amazing! I have to have these. As always, I am impressed and inspired by your work, Nix. And I hope you get to feeling better. Glad you like! These were fun to make; I’ve never been one to pass up a chance to set things on fire play with effects. 😉 And thank you, I’m doing much better now. I came for the illustrious orbs (“crystal balls”) and got sidetracked by your conversation with Nonni! 🙂 I don’t know why…but I always figured that you and I were about the same age Nix (me being finally and fabulously 40). Of course, having major health issues at a younger age can be interesting in and of itself. You must learn to find a healthy balance for yourself, outside of social norms around age and health. I suspect you have found a balance for yourself Nix and I suspect your Sim creations (both stories and giftees) play a small role in healthful ways of coping! 😉 Regardless, I’m glad to know “of” you through the bits of ourselves we share in this massive Sims 2 community. BTW – Thanks for the braziers and the orbs! These are indeed brilliant and the abundance is much more than I expected! First of all, glad you like the braziers and the orbs! 😀 Unlike Captain Janeway, I’m not a woman who occasionally knows when to stop, so I couldn’t convert just one brazier; I had to do them all. 😉 And I love playing with effects! Again, thank you! It means a lot to me when somebody likes my things enough to not just download them, but to take the time to comment as well! Wow, what an excellent job you did with these! You know what? The Ars Magique Arachnoid Brazier, and both the Elevated and regular Great Dúnhelirath Braziers (large or small) would make GREAT fire pits!! Anyway, glad you like them! 😀 And that’s a really interesting idea about the fire pits, I hadn’t thought of that. 🙂 What would be best to clone depends a lot on how Maxis has screwed set things up, though; some stuff doesn’t clone well, so sometimes it’s actually easier to clone something simple, like a vase, and then slap new BHAVs onto it, than it is to clone the real object. (For example, it’s much easier to add fireplace functions to a lamp than it is to clone an actual fireplace.) It depends a lot on what you’re after. I can’t make any promises, but I’ll definitely look into this and see what I can do. Thanks for the idea! Thank you so much for all your great work and for share it with us. These braziers are awesome! And thank you for commenting, it makes my day when somebody does! ❤ It really means a lot when somebody doesn't just download (even though that's great too, of course, that people want to download my things), but takes that extra time to stop and say "thank you." And I'm very glad you like the braziers, too!